As soon as we entered it felt comfortable and welcoming. The staff greeted us with big smiles and seemed happy to help with any queries we had. And queries you will have, unless you are an ale connoisseur that is. Lining the bar are dozens of different and varying types of ale. Not a big ale drinker myself, my companion was on top of the world, eager to see what new and delicious treats he could try. Luckily for him they do a taster, in which you can buy 3 small glasses of ale for the same price as a pint, meaning you really can taste and try. I went for the Camden Town lager, a personal favourite. The guy behind the bar let me try before I bought it; perfect for those we aren’t great at making decisions! My companion drank a pint of ale that was brewed with elderflower. He can’t remember the name of it…but thought it was delicious. Now to the food. There are some very fancy looking starters including Scotch egg with honey mustard mayo and a German sausage platter. They all looked rather lovely but a packet of pork scratching to share for the two us sufficed. For main it is the usual fancy pub food you find in these new ale pubs (not a criticism! ); steak and chips, pea, broadband and goats cheese risotto and moules mariniere. The specials that week included BBQ and stout baby back ribs, which my companion went for. 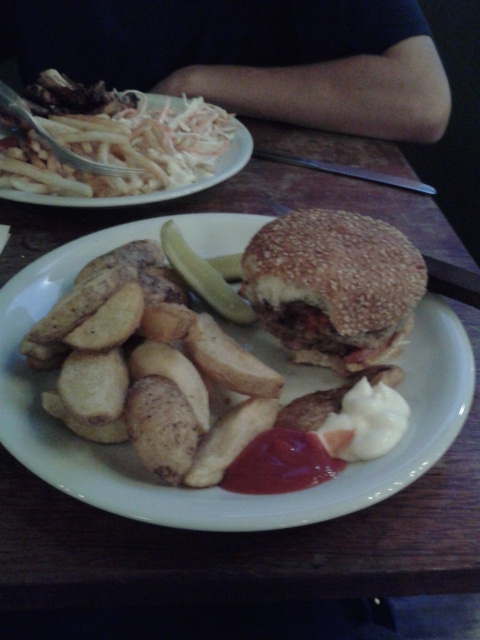 I went for the Brixton burger, mainly because I was interested in what made it ‘Brixton’. Handily with next to each dish on the menu they recommend a different ale – much like a wine waiter at a fancy restaurant. The food came in good time and the staff were extremely helpful making sure we had all our drinks and were comfortable and enjoying ourselves. The burger I must admit wasn’t very Brixton. The cheese was melted onto the meat perfectly and there was a lovely large gherkin to accompany it and with fat chips as a side… so I’m not too sure what made it Brixton but maybe it just because it was being served there. Everything was great apart from the bun which was a little too large and dry meaning that it ruined it slightly. 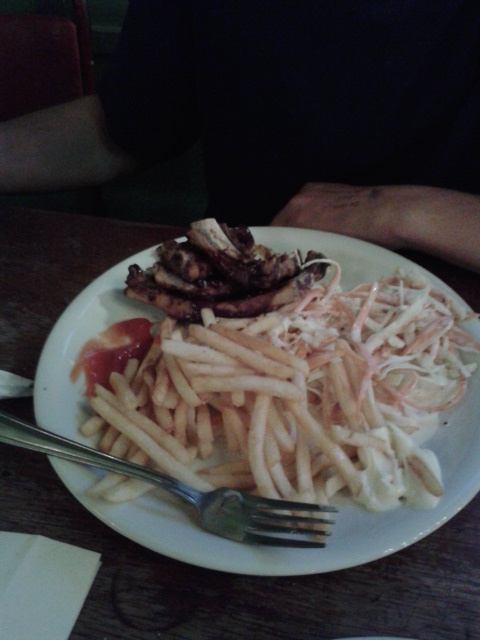 On the other hand the ribs looked lovely but my companion wasn’t a great fan of how the strong the sauce was. The meal came to about £16 each including a couple of drinks. I would love to come back here and try more of the lagers/ales and perhaps a couple of the interesting looking starters…just have to be in the mood for a 15 minute walk. Good read. Having lived in Brixton for 4 yrs, I for one am delighted this place has opened, friendly atmosphere and the beers are amazing! 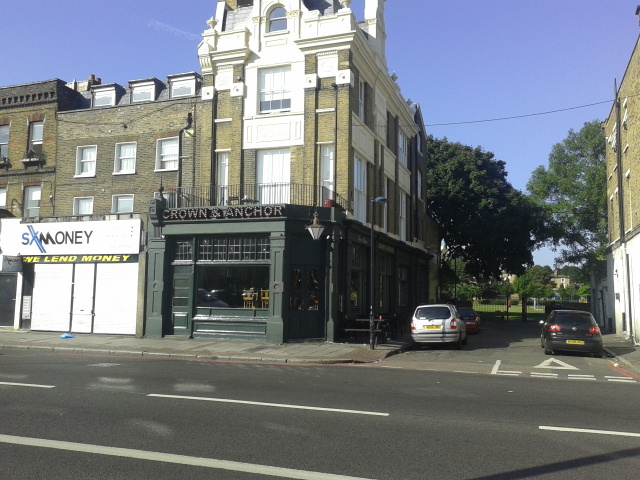 It is worth noting that the Crown and Anchor is a very short walk from the Wynne Road parcel collection office which has its late night opening on Wednesdays. If you have post to collect and live in this part of Brixton then a trip to the Crown and Anchor can be a real Wednesday evening treat.